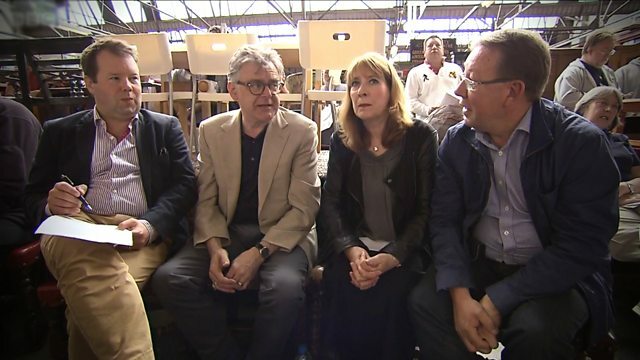 This edition of the celebrity antiques challenge sees Downton Abbey's Phyllis Logan go head to head with her husband, Kevin McNally. Browse content similar to Phyllis Logan and Kevin McNally. Check below for episodes and series from the same categories and more! -We're special, then, are we? who also happen to be a married couple. I'm going to slap that hand. You're almost driving the car in front. You keep doing this - "Up, up! Down, down! Meet Phyllis Logan and Kevin McNally. I'm not really, as you know, competitive by nature. and I want to break all records in terms of profit. What kind of talk is that to your wife? you have already have, darling. auctioneers Mark Stacey and Thomas Plant. To get to meet proper Hollywood stars. -HOLLYWOOD stars. Red carpet stars. are also very familiar from our TV screens. and cup of tea in the evening, watching Downton. And, of course, she played Lady Felsham in Lovejoy. Should we have a wee bet on the side, just between us? I think we should, yeah. you're putting the bins out for the next six months. -You make breakfast every day for the next six months. What about when I'm working, darling? You have to get up especially early. How do you think your experiences in Lovejoy will help you? Ha-ha! The stakes are already high on this road trip. and a 1990s TVR Chimaera. but what will those pairings be? -Good morning? Isn't this lovely? - How are you? Good to see you. - Hi! Hello! THOMAS: Right - who's going to go with who? -Oh, well, I'm going with him. PHYLLIS: You've got me, I'm afraid. - Do you want the TVR? - It's too low down for me. I'd never get in there with my lumbago! and we'll leave the nouveau brashness to them. Mark, are you going to be driving and Phyllis can sit in the back? Yes, shall we do that? -Have you got your chauffer's hat on? whilst Thomas is in for a right pirate's knees-up. And what an adventure awaits. Our route starts in Barham, Kent. finally making for an auction by the Thames at Greenwich. at nearby Canterbury Cathedral in 1170.
once lived near Barham, too. What is Kevin going to be like? Is he quite competitive? See playing games with him? He's got to win. So we need to win. -Well, I'd really like to win. I'd really like to. I think those two will do all right. Oh, Mark, look - shall I give it a pull? -Loud ring - well, it's worked. -I'm Christian. Nice to meet you. -Hi, Phyllis, nice to meet you. You've got some antiques, I gather. Yes, we've got one or two around the corner. -We're dying to see them. -We are, we can't wait. -That way to the showroom. -Yes, we shall. Come on! He's not wrong - there are at least one or two. Good quality as well, which could put of a strain on the old funds. -It's not £16.50, is it? -That's for the table, of course. Don't tell me our co-stars are falling out already. -We got taught this at drama school, actually. MARK LAUGHS It's even got the rapier, too. Now, those look cheap and familiar. -A load of old keys. -Yes. Well, that's what I wear. Very Mrs Hughes. A bit rusty, though. Now, that might suit a pirate film, don't you think? Take the lid off - that's it. -PIRATE'S VOICE: Ship ahoy, Cap'n. ..which is quite a bit. Just what did the actor say to the auctioneer? -Now, are you a good haggler? -Yes. A very good haggler. -Ah! I was born in Bristol myself. -It's a lovely part of the world. it's where pirates come from. It is where pirates come from. -Pieces of eight - it's a Bristol thing. And also to have the meanness of a Bristolian. -They're so tight with money. -Was your mother tight with money? She always said to me, "No, no, you hold on to your money." They seem like shipmates already. Does that make Tom the cabin boy? Deal has a bit of a reputation for smuggling. Seems the perfect port of call for a pair of pirates to land up in...arr! Canute Road - that's where King Canute lived. He lived there - Canute Road. Well, Vikings were pirates, too, weren't they? -Hello - I'm Kevin, nice to meet you. -Nice to meet you. How you doing? -Plenty of loot in 'ere, maties. And Kevin certainly knows what he doesn't like. -My nickname on Pirates Of The Caribbean was Badger. Though I wouldn't want to buy that, cos I can't stand stuffed animals. -My grandmother's house was full of them - dogs. Strangely enough, Phyllis has other ideas. -Oh, he's quite heavy. Not very old. It's produced by a factory called Winstanley. They're more known, actually, for their cats. Oh, right. So that's quite unusual. I've never seen a bulldog by them. But I think bulldogs are very popular subjects. -People like bulldogs. British bulldog. -And we are in a battle. Time to see what Christian can do. We quite like, funnily enough, the bulldog. -Shall we just be bold? -I think we should be bold. They can only ask us to leave. -And we've got the car ready, haven't we? -I'm sure he won't do that. ..but we are on a very tight budget. We thought around, sort of, £30, really. And then I thought we might make a reasonable profit on it. -I'm going to go a bit more. What about 60? -It's not a Crufts winner, is it? -Oh, gosh, he's going down in fives! Come on, Phyllis! This is definitely a speaking part. if we could get it for 45, wouldn't we? Cos I think it'll be estimated at £40-£60. What about meeting me in the middle? £2.50 each and make him 50. -Are you happy with 50? -Let's shake his hand, then. But now Phyllis has spotted something else, it seems. -which we couldn't find a price on, could we? It's part of the display, I'm afraid. That appealed as a piece of, sort of, like an occasional table, almost. -Kind of modernist in a way, isn't it? but I loved that sinuousness - it's Art Nouveau, isn't it? -1900, 1905, something like that. -But it's not for sale. Don't give up so easily. Christian, I know, wants to help us. -Anything is for sale for the right price, my dear. What if we started again at, say, around £40? What if I said about £70? Phyllis is not looking happy about that. it might not appeal to anybody. One of your finest performances, Phyllis. I feel another BAFTA coming on. Why don't we say 50 again, and then it's a round 100, isn't it? -A round 100 for the bulldog and the pedestal. -So it's 110 for the two. It's all right, isn't it? -It does. Thank you very much. and the lamp table for £110. The place, that is, where Kevin is taking charge - here we go. -I like the look of these. -They're rather good, aren't they? -Does he have the weights with it? Oh, there we are - "with brass weights". -Yes, that has to go. He's made an impressive start. Still needs a guiding hand, though. Where the lack of experience comes in. -He can play a bit, too. Tubular Bells is fine, but definitely no Stairway. So, you've got to keep on pumping. Yeah, if you don't pump, it won't make a noise. I think if you were 150 years old, you might have a bit of a wheeze. I'd have a wheeze, yeah! where huge pipe organs would have been impractical. -What do you think that would do? -It is small enough, isn't it? Shall we put that in our memory banks and come back to it? Not exactly going for a song - ha! We can't buy everything, can we? You can't, but you've picked out some amazing things. I'm quite impressed with your eye. Is there anything you're looking for? I'm sure Thomas can come up with something. I've never seen this before, ever, in my working career. What is...? Oh, it's to hold a pipe. Clay pipes, you used to buy them in packs of 20. -Right, cos they break easily. -But this is for travelling. -And comes with its own pipe. Well, I think that's a lovely little item. -Imagine just slipping it in your breeches. -"I got this from a real pirate." I think that might be taking it a bit far. Worth talking to Mick about that and the harmonium. We need to speak to you, quite severely. cos it's a lot of my bank. I'll come straight to the point - I can take £100 off that. Oh, you'd have to take more than £100 off it, mate. -That would still be half my money. I know! I can see how sympathetic you are to my plight. Again, bottom line would be 30 on that. We could take the two for 150? -You know what's coming, don't you? The harmonium and the pipe for 150. This is your last opportunity, Mick. It's not going to happen again. He's good - hardly needs an agent, I'd say. -I've got to make a little bit, haven't I? 160 and you've got a deal. -I like your style! I'd say that myself. -I step in with my sweaty paw. -And give you the dosh. Oh, after all that effort, it's time for a pirate time-out. is very Treasure Island, are you? being a Bristol boy, it's Weston-super-Mud. -My grandmother used to take me there, loads. One year we went there and the tide was in. It was really exciting. -I'm Mark, very nice to meet you. -Good to meet you both. I feel as though I'm back in the Masai Mara. he collected whilst exploring the globe. He collected animals, he shot them. and he was collecting with this scientific purpose. There was always this drive to understand the world he was in. can now play an important role in conservation. -This is one of the specimens. the latitude and longitude of every specimen he brought back. areas of Africa and species. so protect this space and there's a chance they'll be back. to save species from extinction. In the collection, we have this type of thing. -That's amazing. Can I touch it? Again, used by researchers looking at primates. a big game hunter who kept good books? and didn't always use his gun to do the shooting. depict tribal ceremonies as well as wildlife. contributing to a huge archive. In 1905, he wrote a book, In Unknown Africa. places of Africa, we'll start to lose species in special areas. the only place you'll see these animals is in the museum. a genuine love of Africa, even getting married there in 1905.
founder, having nearly killed him. you'll see the major wound he suffered was on his back. dragged him to the ground. He suffered this major wound here. tucked in his trousers, was a copy of Punch. had published the story of the lion. in darkest Kent, heading to the famous resort of Margate. and there is now an art gallery here in the great man's name. No point in locking it. It hasn't got a top. -There is the door here. -Let's walk in the door. -Hi, welcome to sunny Margate. I'm Ron. -Ron, nice to see you. -A lot of clocks, I see. -I'm a clock fancier myself. They're not very good business at the moment, to be honest. Thanks for the advice. We won't be looking at clocks them, thank you. Decisive, Kevin. He continues to impress. -Perhaps they'll pick up a piece of militaria then. M85 helmet. First Gulf War. I wish I hadn't had my fish and chips at lunchtime. You look lovely, but could we please press on? I don't think I could take it off. I'm stuck. -But Kevin still seems intent on following his instincts. -Coming. What have you got...? Is this a dentist chair or a barbers? People associate these things with pain. Remember Larry and Dustin in Marathon Man? -Put your head back, let's have a look. That'll have to come out, for a start. It's a cat and nine tails. Is this something you use on your films. Yes, yes. The lashings will continue until morale improves. -It seems that Ron has always got a bit more shop to explore. -Do you remember Steptoe And Son? -I think it was shot here. I'm not sure the warehouse is actually open to the public, Kevin. My sideburns. Oh, look, big old tuba there. Big old tuba, but there's nothing there. Wouldn't be able to play it. -These are converted to lamps now. with the other great British musical dynasty of Hawkes. -Hey, look, look, look, Boosey. It's a Boosey one. Ron is asking £50 for this battered bit of brass. Could this be better than the 50? -I think 50 is a gift, to be honest with you. -I didn't know it was Boosey. -40. There's a lot of work on here. You've wheedled your way into my warehouse. -You don't like that, do you? and nail me to the floor for things in the warehouse, I'm afraid. and still have 200 quid left for tomorrow, I'd be such a happy bunny. But once we give him 50, I'm under the 200 and I've got no negotiation. -I've got no leverage, you see. -£40 and Kevin will take it away. but honest truth, I think it's a steal at 50 quid. -Boosey is better than Boosey and Hawkes. -I've had a little practice. -45 quid and we'll have a deal. -Go on, absolutely, got it. Yes, the thrill, the adrenaline. I'm becoming a junkie. -Never a script, darlings. Improv, every time. After quite a day, Kevin and Phyllis are together again. Is that a squirrel? It's a rabbit! Oh, we really are in the countryside. -We really are in the depths. -We should have brought a map. -Well. Hasn't his not got any Sat Nav? -I do hope they find their way. Nighty night. Next morning, we're in Sussex where it's raining. Do you need your wipers on? -Do you know where they are? -Have a look there, see if it says wipers. and betting on household chores of course. and just make it totally about the bins. Exactly. Bins and recycling. What a chore. -See, that's you for the next six months. No, Mark's got me sorted, well sorted. but I'm sad to see it's so misplaced. spending a mere £110 on a bulldog and a lamp table, as you do. You be careful with that now, because it belongs to me. ..for a total cost of £205, meaning they've almost £200 in their wallet. -I'm feeling a little bit of insecurity from you. but in the meantime, we're in Sussex at Eastbourne. the Communist Manifesto with Karl Marx. He has his ashes scattered at nearby Beachy Head. Handy. -Are we going to the same place? Let's get there before them. of surplus value as our gang of four shop together. when it came to the choosing, so she's keen to play her part today. -Well, it's nice. It's Art Deco...ish. -It's French, probably 1940s. They don't do terribly well. Kevin is after a new career. I know Thomas quite well and you obviously know Kevin very well. -What do you think they're going for? -It's an actual flying aeroplane. They are going for blokey things as well. -Yes, train sets and stuff, soldiers. -A Lancaster or Wellington bomber cockpit compass. -Oh, that is great. That could be my military thing. Let's have a closer look with shopkeeper, Damian. -Tell him we hate it. -The price of the compass is £85. -Not sure they can see that though. -I want to see the date. -It works, which is great. I love the fact that it's got that box. -We should wash our hands after this. -If this is luminescent, there will be some radiation. Crikey, step away from the antique. Meanwhile, Phyllis has taken Mark outside. -These are what I would call nursing chairs. -Yes, for a mother to sit on. They probably date to 1890, 1900. They're antique. maybe they bought them with some other stuff. Actually, they'd be glad to see the back of them. -There'll be some lively discussion, for certain. -Have a go, see what you think. -What does it feel like? It feels lovely, actually. You could put your feet up. I'll tell you what, it's hard work all this, isn't it? -Knock them down a bit. -You're feeling like you really want it. -I was so wussy yesterday. Prepare yourself, Paul, she means business. and knock you down a bit. We need these at a really special Downton Abbey price, don't we? -I'm emphasising the word, down. No, I'm sorry, we can't do that. -We're heading in the right direction. The pair of chairs for £70. and we could shake your hand. -Go on, have them for 60. -Shake his hand, before he changes his mind. -I hope you win this one. -Thanks so much, Paul. We're thrilled with those. How are the boys getting on with their much-loved compass? Regarding the compass, the gentleman who owns it is currently in Europe. I can't get hold of him on the phone. What could you do that for normally? We could do it for 65.
but the pirates go back on the prowl for more treasure. He's doing that walking away thing - I really like that! The rivals, however, look altogether more relaxed. -Have you ever worked together? Well, mind you, having said that, he did come on to Downton Abbey. -It must be quite fun. It was quite fun, I must say, and this is nice. I mean, this is...like being on a little holiday. Yes, it is, coming around and having a look. The boys, though, are keeping their minds on the game. -I like that Iraqi silver. -At the back? That is nice. I do like that. baklava or something like that. This is on copper with silver. Is there any interest? I mean, I think it's lovely. emerging economies of the Middle East and this is a near Middle East piece. And they do like to buy back their works of art, which will create it. So you have got a possibility with something like this. 100 quid, really, hasn't it, or 80? Go and talk to them about that, yeah? I asked him to make my day. He's come in at £110. -He actually paid 110 for it. -so that gives you 170 for the two items. I think we're almost there. Almost all the cash gone, too. -Well, I think it's these two, isn't it? -We going to do it? -Leaves us a little bit of money left but we didn't spend it all. Well, we'll spend it down the pub. Thank you. -Better give you some money. and the Middle Eastern silver-on-laid-copper plate for a total of £170. with one side still hot to shop and the other aiming for the stars. -You're quite into astrology, aren't you? is really quite different from looking at horoscopes, or astrology. When I was a kid, I took one of the first astronomy O-levels. They're making for Herstmonceux, East Sussex. to escape this weather, much remains. -Are you like a boy in a sweetie shop? I can't express how excited I am. -Helen, nice to meet you. -Hi, Thomas. Come on in. -This is Tom, but don't mind him! from a previous pitstop by Charlie Ross. an unknown Austrian physicist into one of the world's most famous men. in proving Einstein's theory of relativity. was that even light is affected by gravity. but it was actually the sun's gravity bending the stars' light. Deep stuff, eh? You keeping up? which is a central core of special relativity, isn't it? -That's what I was going to ask - what is the theory of relativity? -We don't have the time. at the time couldn't wrap their minds around Einstein's ideas. was British physicist Arthur Eddington. to get observational proof of part of Einstein's theory. was sent along the route of the next eclipse. -during the eclipse, to prove Einstein was right. obviously, we just see the blue sky of the atmosphere. Actually, when you break it down, it's an extremely simple experiment. Yes, and that's the genius of it, I think. But the task was far from easy. obscuring all but a few seconds of the eclipse. They had one usable picture but it was all that was needed. Einstein was proved right and science was changed for ever. and two telescope lenses, both of which are now housed on this site. This is an actual lens from the telescope? -The actual lens that was taken to Africa. -It's a mighty lens, isn't it? And to think they were hand ground at the time, as well. -Where's the rest of the telescope? -Your guess is as good as mine. -I think it was left. -All we have is the lens now. That's where the money is, the lenses. Talking of which, just shut that because he'll have that auctioned by the end of the week. "Lot one, a very famous lens. £5 million." Make sure it's locked up. Get out! used in the experiment is still in use here in Sussex. -Well, this on top is the viewfinder, right? -Yes, that's the guider scope. The guider scope. But this is the telescope with its original Brazilian lens? Yeah, this is the lens that was taken to Brazil. -It's like you're some sort of mad professor. -I am a mad professor. I feel like it. I just need my hair up a little bit more and start talking like Patrick Moore! And Helen and I are your, sort of, pupils. And you know so much! I'm so impressed! Well, I know so little compared to these guys. Could I move this telescope? -Yeah, I can take the clamps off for you and you can move it yourself. Oh, I'm so excited! Are the clamps off? HE GASPS Look at that! The simplest touch - just move around the sky. -I love the dial there. Boys and their toys, eh? Ah, we're doing that again, are we? There they are. ..Phyllis and Mark still have work to do. Oh, it's nice and dry in here! -Pleased to meet you again. ..although I think they're taking it in turns. Well, we've got a dog. Maybe we should get a cat. Mark's got a similar approach, it seems. -I think this is Indian. Indian brass work. I think it's quite nicely made, actually. It's all hand engraved there and the bells are quite nice. So that would have been made when, do you think? You'd think something like that was fairly modern, wouldn't you, really? You know, this is all handmade nails here. I don't think it's any later than around about 1920. -So we're heading off to 100 years old. -Do you think it would do well? These type of items are becoming more collectable. You know, Chinese, Indian, Arabic items with a bit of age. The ticket price is £30 - but are they agreed? I think it just might stand a chance. -Not impressed with my old cow? this type of art, you know, it could sell for a fiver. -I know. I think it might. -You're not indecisive at all, are you? -Look, shall we just ask what the best price is? We might have a little something which intrigued us. That's no way to speak to your guest! -Well, I just think it's rather fun. HE SNORTS I heard you snorting there! -Well, 15's such an odd number, isn't it? 12 is pretty odd, as well! Should we say 15? Are we being too mean? -I think we should say 15. -For a little cow and baby. -I do hope we can milk a profit on it! Quite! Time to move on. and their last chance to buy. Oh, hello. You must be Rhoda. We've got to you in the nick of time but we have so little time. you want to help two desperate people? Rhoda has a bit of an eye-catching novelty item. Oh, yes. Say hello to Diana! -Oh, my gosh! It's scary, isn't it? Sounds like a no to the lovely Diana. Anything a bit smaller? He looks like a military naval type, doesn't he? -Is it a doorstop or something? -It is. It's filled with lead in the bottom. I mean, I thought it might have been Nelson. -It would be lovely if we could find something with Nelson on it. is terribly cheap, we take that for a laugh. and utterly mad. And we have, haven't we? -They won't be expecting that, will they? -Cos you hate the doll, don't you? -And I hate the doll. -And they'll hate the Doll. You don't have to buy it, Phyllis. -I don't want to touch it. It's like a jockey's outfit or something. -I just think she is so ridiculously hideous. -..and could you please let us have it for £10? -I'll do her for 20. -You won't shout at me at the auction? -Let's not put any naked flames near her. -Get back in your box! -"Don't want to go back in the box!" -She's going back in the box. -"I don't want to go back in the box!" # I love you, but do you love me? Well, that rather unusual purchase completes their shopping. So, what will they make of each other's offerings? -I was going to let the lady reveal first. - I think that was very sensible. - Oh, really? Yes. -So, I'm going to take this off first. -We've obviously got a doggie here. I know, but I've seen the cat - I've never seen a bulldog. -I've never seen a Winstanley bulldog. -And I think he's rather charming. -OK, and the pair of chairs? -The pair of chairs, again. -Shall we walk round? Come on, Kevin. I did want a chair but we got a pair. Inlaid. And I've just seen the horror show! -Do you know, that's the reaction I wanted! Do you know, I thought rather than go safe, we'd go hideous, didn't we? -Well, that you achieved, let me tell you. -How much is the horror show? So, how much have you spent? -Actually, I'm sorry. We didn't spend a lot. We spent that on the first day! Yeah, well, they're playing a canny game that I would never have considered myself. Let's have a look at your booty, then, chaps. -So a pirate's pipe holder. This is a compass from a World War II Lancaster or Wellington bomber. -Where did you get that? being the instrument upon which the theme tune for Hancock is played. -Mark and Phyllis definitely approve. Not the most practical thing. Not the most practical, but a fun object. I can't imagine our sets of objects being any more different. I've never seen such a pile of tat in all my life! I just thought it was all hideous. Well, they managed to spend every last penny, practically. I don't dislike any of their items at all. That doll is the worst thing in the world. It's a horror show! I love the little Islamic brass and silver tray. We have definitely won the battle. But we could lose the war. He loves all the wartime stuff, Kevin. -The military thing I'm quite frightened of. like the true men that we are, the pirates. Yes, we are the pirates! with a fine and rich maritime history. -Well, it's a lovely day for it. It's nice, Greenwich, isn't it? I feel like a bit of an East End villain in this car, though. -I used to drive for the Krays, you know! How do you think you're going to fare at the auction? I'm not terribly confident, Tom, to be honest. I honestly think that because you've spent little, you might gain a lot. I see what you mean. See, you're building up already for losing. I really like your stuff but I don't think it's going to make any money. I know, I think that's probably a very fair appraisal. -but I wouldn't pay that for it. -I wouldn't have yours in the house. this South-East Road Trip concludes at Greenwich Auctions. -They're the ones who should worry, aren't they? -Come on, let's go in. -So, who will win the day? Let's hear from auctioneer Robert Dodd. It's an iconic piece, typical 1970s. Lovely it's got its box with the illustration. And let's hope we've got a Diana doll collector. I think the one that's going to struggle is the harmonium. I don't think you'd be happy if you lived next door to someone who played one of those things. Fasten your safety belts - it's going to be a bumpy ride! First out of the traps, Phyllis and Mark's bulldog. -It's going to make £65, £75. -Oh, Thomas, you don't know that! -Stop trying to predict it. -Have you been to his sale room? A bid with me of £45 only on the bulldog. Looking for 48. 50 with me. -I've got 50. Are we all done? -You've broken even on that one. He doesn't look all that happy, either. It's ours coming up and I want a bit of that 80, 85, 90. -You like that, don't you? -Love a bit of that. Hmm. That may well be a pipe dream. at £22 on this. Looking for 25. I've got 22. Looking for 25. £30 I'm at. Looking for 32. I've got £30 on it. -Looking for 32 anywhere. Are we all done? Looks like Kevin's pirate endorsement didn't pay off. I don't even mind if it's Phyllis's any more. You know what I mean? -That's very magnanimous of you! -It is magnanimous of me. Now for Phyllis and Mark's table that wasn't even for sale. And it's got to start with a bid with me of £38. That's better than I thought, to be honest with you. -It's worth all of that. -It's worth more than that. 42 with me. Looking for 45. 45 on the phone. -Oh, there's a phone bidder. Come on, a bit more. -Are we all done? 48. -48 at the back of the room. £50 only I need. -50 I've got. I'll take 52. -Well done, madam. Someone with taste. -We all done? Last time at 50. -Come on, a bit more! Better than it might have been, but another loss, I'm afraid. -It all changes from now on in. -We start with our tuba. This is when you get really trounced! Yeah, can that thing play the Last Post? Got to start with a with a bid with me of £35 only on that. -I think it's worth all of that. Looking at 38. I'm looking for 38. I've got 35. Look 38. -40 with me. Looking for 42. I'm looking for 42 anywhere. -No! No, more, more, more! -Last time on the tuba. At £40. I think you were too "Boosey" when you bought that. Someone's got a nice tuba for not very much money. I wonder how Phyllis' chairs will fare. I'm not sanguine, I'm not sanguine. But best of luck to you both. -Thank you. Do you mean that? Do you know, that was said with such insincerity. -Bids with me at only £45 on these on the pair. -I've got 45, I'm looking for 48 anywhere. 48, 50. 55 I'm out if you want 'em. -I'm out at 50. It's a fiver. -Yes, come on. Bit more. I'll take 62. Hello, stop shaking your head! 62. Can't get an Happy Meal for that. Here, £60. 62. 68... No? 68 there, looking for 70. Are you sure? Sadly that's a loss, after auction costs. -Our first profit, well done. -Oh, yes, did you hear that? -We're all in it together. "we're all in it together." Kevin and Thomas's plate is up next. I'm feeling bad it's over 100 quid now. And it's got to start with a bid with me straight in at £32. -35 on this dish. Got 32. I've got £80. I'm looking for 85 on this dish. Are we all done? You sure? Got 80. That was like a knife in my heart. Can you be "coppered off"? At least Phyllis and Mark's figurines came cheap. Somebody's on the phone for it already! I've got 10, 12, 15 with me. Looking fro 18. I've got 15, I need 18 anywhere on this. Are we all done? You sure? -Cos I really loved them. -Can we have our money back? Could we go and do it again? -This is just a dress rehearsal. -Can we do it next week? Yay! -When we really do it, it's going to be much better, right? Yeah, break a leg, everyone! Talking about your doll, darling. -Was that the last lot? -I think it's your last lot. That's your piece de resistance. They really are a pair of...pirates. Penzance and Caribbean over there. The compass which guides us to our golden doubloon. The Isle of Dogs, more like! Got to start with a bid with me of only £45 on this. 50, 55, 65 - I'm out. Yes? Geez, it's like pulling teeth! -Yeah, we got it over there. 65 there, 68 I need. You can't pull out - you started it. 68 there, £70 over there. Take 72. I need £72. Hello? looking for 78. 78 I want. I've got 75 with you, sir. Well done. You made a profit there. -Profit's a profit whichever way you slice it, right? We've got to pamper him. I'd almost given up hope. It's the doll from hell. This is going to walk us right into profit. Was that a joke, Mark? There will be no justice if that is the case. -I won't be able to show my face! -Oh, don't be so bitter! What do you think this is anyway? No! -You'll be known as The Doll Lady from now on, won't you? Absolutely cracking, stunning lot coming up here. I've got to be honest with you, I want to start this at three grand. It's got to start with a bid with me of only £18. She's worth that, I want £20 on this. I've got 18. I want 20 on the doll. Might as well stay here, I want £20. It's worth all of that. I'll take 21. Our computer don't do 50ps. I've got 20 there, I'll take £21. We all done? 21 there! 22 I need, madam. 23 there. Looking for 24. Looking for 26. Are we all done? Last time. Are you all sure? You'll kick yourself when you get home! 25, 26 - are we all done? She'd make a good scarecrow for someone. saying "harmonium for sale" is obviously paying off. Let's pull out all the stops - ha! and find out if there was a harmonium appreciation society. But they closed in about 1795. Bids with me at only £70 on that harmonium table. I want 75. It's worth all of that. £95 I need. I want 95 anywhere. 95 I need. I'll take 92. -90, I'm looking for 92. Are we all done? but Thomas has the scores. -you're taking out the recycling. -Nobody likes a gloater, Phyl. leaving them with just £283.30. -There's really nothing in it. -We've had a great time. -I'm only sorry we didn't make any money. -But it was really good fun and very exciting. Never mind. It's been fantastic. -Thanks, Tom. Let's do it again some time. We'll flog the Jag and make some money. A battle for antique supremacy sees Downton Abbey's Phyllis Logan going head to head with her husband, Pirates of the Caribbean star Kevin McNally. The competition is fierce as the celebrities head through Kent towards an auction in Greenwich, London, each travelling in a classic car and accompanied by an antiques expert. En route, Phyllis visits the impressive collection of a controversial conservationist, while Kevin reveals just how much he knows about the universe.